1.1. In wide, shallow dish, soak skewers in water 30 minutes. In blender or food processor with knife blade attached, purée garlic, 3/4 cup coconut milk, brown sugar, lime juice, fish sauce, ginger and turmeric. 2.Thread chicken onto skewers, weaving chicken in and out of skewer; place in medium, deep bowl. 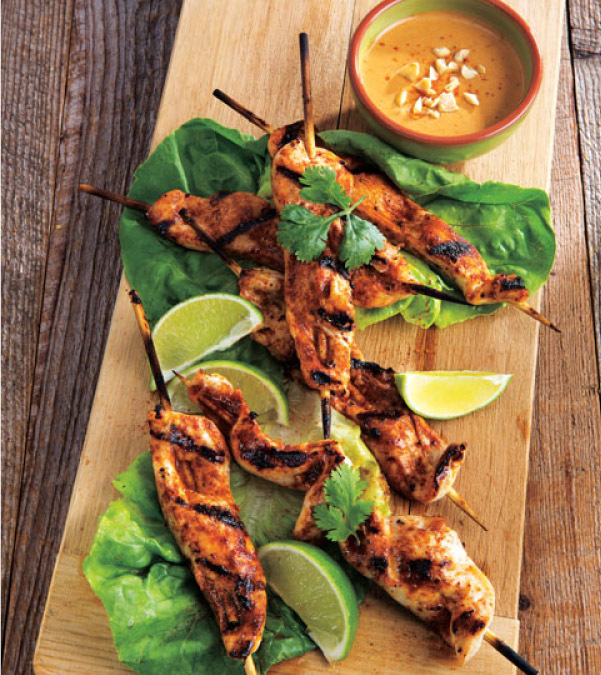 Pour 1/2 cup coconut milk mixture over chicken skewers and rotate to coat evenly; refrigerate 30 minutes. 3.In small saucepot, heat onions, peanut butter, soy sauce, red pepper flakes, remaining 1/2 cup coconut milk and remaining coconut milk mixture over low heat until mixture simmers, whisking occasionally; cook 2 minutes. Remove saucepot from heat; keep warm. Makes about 1-3/4 cups sauce. 4.Prepare outdoor grill for direct grilling over medium-high heat. Remove skewers from marinade; discard marinade. Place skewers on hot grill rack; cook 8 minutes or until internal temperature reaches 165°F, turning once. Serve with peanut dipping sauce.